The Washington governor’s role as chair of the Democratic Governors Association this year has sent him on frequent political trips across the country to raise money and promote Democratic candidates. As chair of the Democratic Governors Association this year, Gov. Jay Inslee has elevated his national profile as a critic of President Donald Trump and fanned speculation about a 2020 presidential bid. The role has sent the second-term governor on frequent political trips across the country to raise money and promote Democratic candidates. Since Jan. 1, Inslee has spent all or parts of 49 days on more than a dozen DGA-related trips out of the state, according to his official calendar and other public records reviewed by The Seattle Times and public radio’s Northwest News Network. He has headlined an Iowa Democratic Party dinner, spoken at the liberal Netroots Nation conference in New Orleans, attended meetings at a beachfront hotel in Hawaii, and made multiple forays to San Francisco, Washington, D.C., and New York, among other destinations. On his most recent DGA-related outing, Inslee took a chartered plane Aug. 20 to Bandon Dunes Golf Resort in Oregon to attend a DGA fundraising reception. He returned the same day. He pointed, for example, to Trump’s efforts to undermine the Affordable Care Act and last week’s rollback of Obama-era pollution regulations. “I don’t really like spending time in red-eyes and in airports, but it’s been important,” Inslee said. Republicans have criticized the travel schedule, arguing that Inslee’s eye is on national politics instead of running state agencies. State Republican Party Chairman Caleb Heimlich pointed to Inslee’s trip to Miami in June, just days after the state’s largest psychiatric facility, Western State Hospital, lost $53 million in federal funding due to failing an inspection. The day before that announcement, Inslee had returned from a political visit to Iowa. Inslee rejected the notion that his travel has interfered with his job as governor, saying he stays in contact with staff and state agency heads even while out of the state. “I guess the Republicans haven’t figured out the mysteries of the cellphone, but we find it quite an effective technology. And I can do this work anywhere there is a cellphone, and I do it,” he said. Previous Washington governors, including Christine Gregoire and Gary Locke, also served terms as DGA chairs and, like Inslee, traveled the country to promote fellow Democrats. Jaime Smith, a spokeswoman for Inslee’s office, said a quick analysis by the office’s technology staff shows that he travels out of state substantially less than Gregoire did as governor. Inslee’s political-travel costs are borne by the DGA, not taxpayers. Inslee’s political spokesman, Jamal Raad, said the 49-day tally by The Seattle Times and Northwest News Network of Inslee’s 2018 political travel could be misleading because the governor departed late at night or returned early in the morning on some of the trips. Two of Inslee’s out-of-state trips — to New York and Washington, D.C., in February and to New Mexico in July — were scheduled around nonpartisan National Governors Association meetings, which are considered official business, but also included DGA-related political fundraisers or other events. Inslee’s political campaign swiftly emailed a video of the moment. The increase in Inslee’s national political activity comes as Democrats seek to overcome a vast deficit in governor’s mansions. Republicans now hold 33 governorships, to 16 for Democrats. One governor, Alaska’s Bill Walker, is an independent. Democrats have a shot at picking up several seats this fall. There are 36 gubernatorial elections in 2018, with 26 in states held by Republicans. The nonpartisan Cook Political Report rates nine of the GOP seats as toss-ups or leaning Democratic, with just two Democrat-held governorships rated as at risk of flipping to the Republicans. One of the seats Inslee and the DGA hopes to win is in Iowa, a toss-up race where Republican incumbent Kim Reynolds is being challenged by Democrat Fred Hubbell. Arriving in Iowa June 21, Inslee spoke two nights later at the Iowa Democratic Party’s Hall of Fame dinner in Altoona, Iowa — an event known as a testing ground in some years for Democratic presidential hopefuls. In his speech, Inslee promoted Hubbell while sprinkling in boasts about his own record, including his “F” rating from the National Rifle Association and his vote in Congress against the Iraq War. Inslee also held up Washington state as a success story that has “blown up the Republican myth” that progressive policies like a higher minimum wage and paid family leave are harmful to the economy. A longtime clean-energy jobs evangelist, Inslee called rising global temperatures an “existential crisis” for Iowa and the world. “The effort to defeat this menace has been the driving motivation of my time in public life,” he said. A big part of Inslee’s role as DGA chair is to raise money to fuel political advertising and get-out-the-vote efforts. Asked about that part of his work, Inslee gave examples of recent meetings with donors including an unnamed Colorado couple who once owned hotels in Washington state. “I had some of the most delightful coffee cake I’ve ever had with breakfast at their home and we talked about how important these matters are. They’re helping us,” he said. Inslee and the DGA did not name the couple or donors he’s met with, but pointed out that the organization discloses contributions as required by law. The DGA recently announced it raised a record $26 million during the first half of 2018 — much of it from individuals. For the 2017-18 election cycle, the group has raised $67 million. That was outmatched by the wealthier Republican Governors Association, which has raised $113 million in the 2017-18 cycle so far. Heimlich, the state Republican chairman, said Inslee’s rhetoric shows he’s seeking to become a national figure, citing the governor’s climate talk, including his support for Initiative 1631, which would impose a fee on carbon pollution from fossil fuels in Washington. “He’s pushing policies like this carbon tax which he wants to be his signature issue that he wants to run for president on,” Heimlich said. As he has for months, Inslee shrugged off speculation on his political future, saying he has made no plans beyond this year. “I haven’t ruled out running for anything, including a third term in 2020. 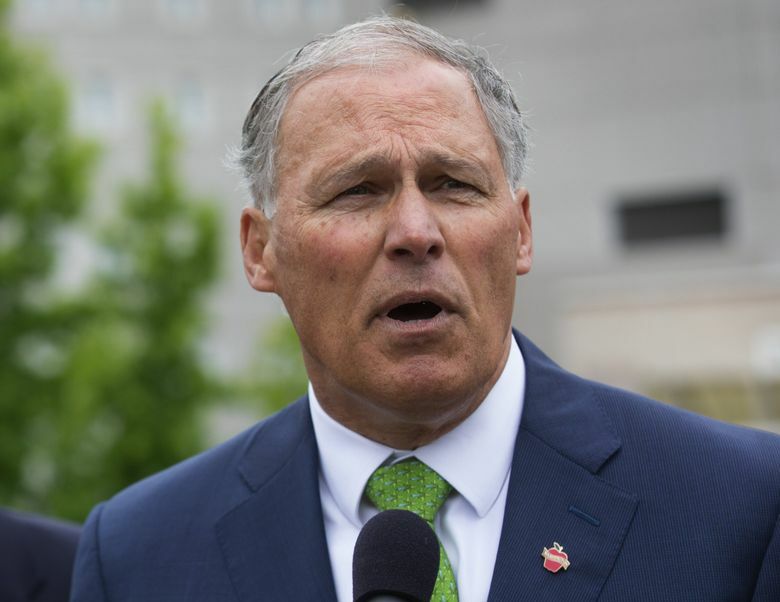 The only thing I know about 2020 is we do need someone, a Democratic nominee, who will make carbon pollution and climate change front and center in our efforts,” Inslee said. This story was reported in conjunction with Northwest News Network, nwnewsnetwork.org, a collaboration of public radio stations in Washington, Oregon and Idaho.